Some of the simplest concepts in relational databases can catch out even the more-experienced programmer. Surely, everyone understands database keys? Perhaps not. The usage of keys is a subject that has never quite bedded down to a happy consensus. It causes some heat, and raised voices, amongst database people. We’ll try out a few things, and try to introduce a few concepts as we go. We’ve put a glossary at the end. You might need it. This workbench got started when we got arguing how the Natural Key 007 would have got allocated to James Bond, and then how they could distinguish James Bond from the previous 007s in order to do any accounting, such as calculating expenses or sending out a Bar (Mess) bill. We ended up concluding that it was completely useless, and probably masked a surrogate key. In fact to insert a new secret agent into a table, you’d probably want to allocate the lowest available number. PERSISTED NOT NULL ,--e.g. 007. --This is just a string representation of the MyNumber column. Load the agents here from the file attached. --the name into the table. --and you would use it like this. This is OK as far as it goes. The trouble is that it doesn’t go very far. The only way you could use this as a primary key is if you deleted all references to the previous agent with the same code. If you have referential constraints in place, then you are prevented from doing anything silly by mistake. Yes, you will find systems where it is done like this. The trouble is that Databases generally need a history. No accountant would tolerate a system where all the records relating to an employee were deleted the moment the agent was exterminated by a villain. Nothing would balance. A payment to an employee remains a payment even after the employee has been eaten by a shark. Let’s face it, you’re going to need a surrogate key. What do we do about the 007 nonsense? Ah, they want to keep it. They point out that they are unique because the code is only assigned to the current agent. It would cost too much for the business to change the system. We then arrive at an uneasy truce. We use a compound key to ensure uniqueness. Now Dion Prince gets sliced in two by a laser so we retire him by taking away his 0 in the holder column so someone else can now have his cherished 003 moniker. At this point, it is easy because the key hasn’t been used! This is unrealistic, because in a real database the primary key will have been used and so this will cause an error. We’ll come back to this issue later. Normally we take great care to ensure that a candidate key is immutable. Now the stored procedure can be altered slightly to add the fact that there can have been several holders of the 003 moniker but we want to reallocate it only if it isn’t there, or it is currently vacant. --what is the lowest currently available key in the 00 range? we’ve now jumped through a few hoops in order to allow the business their natural key. Why all the fuss? You will get people arguing that keys must be natural (or, perversely, that they shouldn’t be) or that they must be immutable (that you should never change its value). I’ve even heard it said that all joins must be on key values. Nope. Do what you think best. There are no ‘best practices’ or hard and fast rules, but you will have an easier life if you deviate from normal practice only when you have to. We’ve sneaked in a surrogate key. 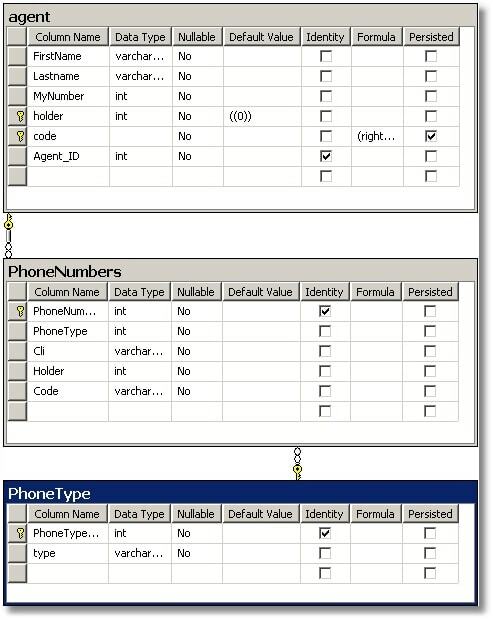 Although the combination of moniker and holder number will be useful in tables which hold the agents’ information, so it is easy to check things like addresses, contact numbers and so on, we’ve decided to use a surrogate key as well, for tables that pertain to entities that have no ‘public’ meaning. What about a bulk insertion? No problem. As we are doing a once-only import on a new table, We’ll drop the the Code field altogether for now, and then recreate and populate it after the bulk import. In fact, you can do bulk inserts later on an existing table but they’ll be slower. We’ll have to assume that the first nine imported rows are 00 status, then the next ninety are 0 status and the following 900 are boring three-figure numbers. the next thousand will be replacements, and so on. At this point onwards, we used SQL Data Generator. Apologies to anyone who hasn’t already got it. To follow this bit, you’ll need to download it for a fourteen day free trial! The reason is that, later on in the workbench, importing into tables that involve foreign key constraints is tricky to do by hand. Also the million agents were a big file, (to say nothing about two million phone numbers). -- and we can add a surrogate key as well. --anything else is just too tedious. Now we have the simplest possible database with foreign keys. We now hear the sad news that 005 has been cut in half by a laser. --and now we can add a new volunteer to die for his country! So what have we learned? Although natural keys can be made to work, and can perform well, there is always a payoff. The database designer is right to use surrogate keys wherever he can but he should not be afraid of circumstances where that isn’t possible. Where all the business operations are done through stored procedures, then the complexity can be hidden from the application programmers, and one can cheerfully commit ‘crimes’ such as changing things that ought, perhaps, to be immutable. We’re inclined to agree with C J Date and Joe Celko that we should be less doctrinaire about keys. Above all, we reckon that this sort of approach should be tried out on a slow machine, with as much data as possible, with all metrics switched on! To be usable, in other words to be able to unambiguously identifify a database entity, a key must be unique and known (i.e. not NULL). It can consist of one or more attributes (columns). A key is no more than a ‘candidate’ until you use it and you can have as many candidate keys in a table as you like. A key that contains more than 16 bytes. It is said that these do not perform as well, but if this is true, it is usually too slight to notice. A key consisting of several columns, in which all values are known (not null) and, in combination, are unique. a key with a unique and ‘not null’ constraint. a key containing unique values across all component columns. a key containing information used by people. Primary keys for business entities such as invoices, deliveries or products are generally best if they are composed of something the business already uses, such as a product code, shipment reference, customer reference, or invoice number. and is part of their culture. This type of key is the so-called ‘natural key’. There is a problem with having a meaningful key. If the data that formed the natural key (such as a person’s initials) was was wrongly entered, the key will be wrong but the business will already “know” the wrong version. a computer-generated candidate key. Surrogate keys such as the ‘Identity field key’ are the normal way of getting round the complexities of trying to handle Natural keys. If the business uses incrementing numbers that can be huge, and they don’t mind gaps, then you can use these identity fields. However, more often you’ll find that businesses have arcane rules, passed down from distant tribal ancestors, and they resent having to change their system. There are often good reasons for this. The cost of retraining, or changing the corporate culture can be astronomical. It is their choice. As Codd says, ‘Users […] are no longer compelled to invent a user-controlled key if they do not wish to’. We can play it either way. Obviously, where a table represents something that has meaning only within the database schema, a surrogate unique key that is machine-generated, such as an identity field or GUID, is fine. However, where this isn’t the case, you are running a risk by using one because, when things go wrong, it is much easier to sort things out if the keys are meaningful, and errors are so much easier to spot too before damage is done. While Surrogate keys make the coding of databases easier, they are disliked by book-keepers accountants, retailers or anyone else who has to handle them. They aren’t human-friendly. Also, identity fields that are so often used to create surrogates can sometimes catch you out in surprising ways. A key that uses several non-null columns. A candidate key not assigned to be the primary key. This is a constraint to the effect that one or more columns in a table are to be a candidate key. A primary Key constraint just defines the default candidate key. This is a key whose value cannot be changed. This is the normal assumption, though it is seldom enforced. Robyn Page has worked as a consultant with Enformatica and USP Networks with a special interest in the provision of broadcast services over IP intranets. She was also a well known actress, being most famous for her role as Katie Williams, barmaid in the Television Series Family Affairs. She is currently having a career break to raise a young family. Your points about keys – natural and surrogate – are well taken. LOL. You’re right, I’m sure. This was a difficult article to write. It went through several drafts. Originally, Bond appeared only at the end as a flourish, but we realised we could illustrate a couple of points about keys with 007 and the idea sort of rather took over the article. Somehow it all jelled once we did that. It all started when Robyn and I were arguing how one could use a derived column as part of a key with the PERSISTED keyword, and we were stuck for an example. We thought of Bond’s code name, and wondered how on earth one could have processed agents expenses with a system like that. Key theory is flaky at best for most practitioners. First: Even if Codd defined it differently at times, C.J. Date surely noted that from relational theory there are just candidate and super -keys, nothing else. Keys *do* however have a lot of (definable) properties like compoundness, scope, visibility, information entropy, information value, familiarity, stability, mutability and much much more (there are probably hundred or more attributes to be discovered for keys). Given these properties you construct a Key Taxonomy or Ontology based on these properties. The classes you then get construct can reflect the names everyone uses like Natural Key, Surrogate Key, Intelligent key etc. Only from the Ontology or Taxonomy it is possible to talk unambiguously about types of keys. Everything else is just trying to find common ground without a good foundation. How about a simple association table? This way in AgentTypeAgent we can keep a historical record of all 007 agents, or any other type code for that matter, where the current would be the one with latest StartDate in AgentTypeAgent. It is rather a design issue than a key domain issue. Wonderful article. I always look forward to your though provoking workbenches. I know this was a discussion on key construction/selection, but one of the items that stuck out for me was the need for a transaction in the InsertNewAgent procedure. Both the check for an available agent number and the insertion of that number into the table can be combined to avoid this need. Here is an example of what I mean that uses a number table function. Oh, and as a quick aside, it would be grand if you added the SQL Prettifier for these posts. /* Try to insert the new agent. “They are no longer required by relational theory for a table, just a candidate key, and are, according to CJ Date, included only for historical reasons. ” What’s you bibliographic reference for this statement. Sorry to be so long in replying!